Does your dog need supplements? Yes s/he absolutely does, 100%. Just like people, dogs require dietary supplements for healthy growth and to maintain and/or improve their health. People often give their dogs supplements more as an afterthought, instead of as a necessity, and more so, regularly. It is often assumed that the dog that is fed with raw meat and homemade dog food is deemed to get all the nutritional elements they need for optimal health. This is however an incorrect assumption, in the same way that the delicious home cooked meals that we humans have from time to time, is insufficient to provide our bodies with the daily nutrients it needs. In any case, it is undeniable that the quality of a lot of our human foods have been compromised with the use of all the various chemicals like fertilizers, pesticides, preservatives and more used in the growing, processing or storage of these foods. The same can be said of many dog foods. Pet nutritionists and veterinarians argue that we cannot just create a meal and call it a supplement, or assume it will provide our dog all it needs, nutritionally. Various processed dog supplements can be purchased online from online dog stores and from vet shops. A prescribed dosage or mixing ratio should however be always adhered to. This is because different supplements and their dosages have different effects. For example, too much of calcium supplements can cause skeletal problems. Likewise, too much vitamin A can cause dehydration and joint pain in dogs. On the flip side, a vitamin A deficiency can lead to a weak immune system and such a dog will be prone to diseases and infections. Similarly, a lack or deficiency of certain vitamins or minerals can lead to several health issues for your dog. An iron deficiency can lead to anemia. Such nutritional deficiencies can be managed or prevented with a diet that must involve dog supplements. The following are our top 10 rated dog supplements that will keep your dog healthy and strong. If you desire an extra strength formula that supports the integrity of joint and tissue structures in you dog, look no further. Paws & Pals supplement promotes healthy immune system and mobility in dogs. Each bottle of the supplement is packed with 240 soft chews. On the basis of the weight of the dog, a few of the soft chew supplements are to be administered each time. Best results are expected to be observed within the first three weeks. 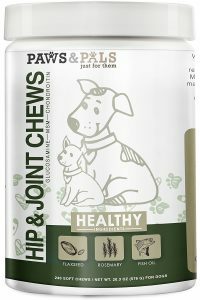 Paws & Pals Glucosamine Chondrotin is definitely one of the best joint supplements for dogs. This is an all natural dog supplement that does not contain corn or wheat. This is the best supplement to boost the appetite of a dog. In addition, the supplement enhances hair growth and repels fleas. Vets also advise dog owners to use it to control itching, dry and flaky skin. In the same way that a lot of people are turning towards natural foods, dog owners will also do well to look into a natural dog supplement for their pet. Sometimes, dogs may have peculiar pains. Activflex is a supplement that serves as the best painkiller for dogs. The supplement provides your dog with the best medical ingredients to improve hip and joint structure. As a result, the dog will have better flexibility and decreased joint pains. 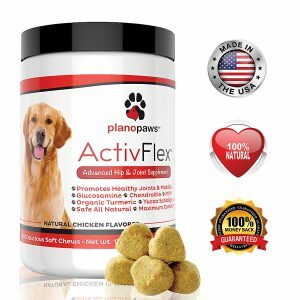 Natural ingredients in Activflex supplement are perfect for a dog of any age. This supplement plays a vital role in maintaining joint functions for dogs. 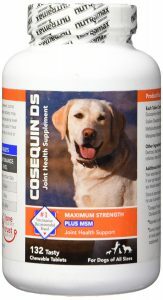 The number one recommended supplement by Vets for joint health is the Nutramax Cosequin DS Chewables. With a naturally occurring organic compound, it remains the most preferred joint supplements for dogs of any age and size. 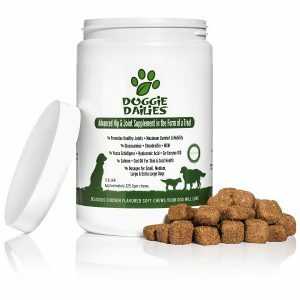 The taste of this supplement is one that your dog will love. This supplement is made with natural and delicious vital minerals and vitamins, enzymes, and nutrients that your dog needs for strength and energy. One pack of the supplement contains 225 chicken flavored soft chews. They are so delicious that it will leave your dog begging for more. Hip and joints will also get an enhancement. No pet owner likes to see his or her dog as a weakling. For this reason, dogs require a supplement that will enhance strength, build muscles, power, and speed. Supplements are a sure way of raising immunity and strength in dogs. 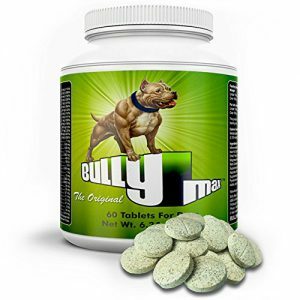 Mainly, supplement ingredients in the Bully Max include a mixture of fat, sucrose and corn syrup. The benefits of Turmeric has long been to humans dating back 4,000 years. Gladly, many of the same benefits that we derive from the plant are applicable to our beloved pets. Any breed of dog can take the Hip + Joint soft chew supplements by Genuine Naturals, and reap the immense benefits. The supplement is made of tasty sugar-cube sized supplements that ease aches and pains in dogs. In addition, the supplement also plays a major role in restoring energy and mobility in your dog. 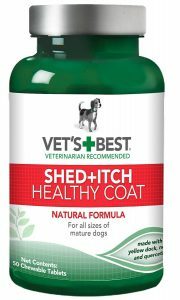 This is a bottled supplement that maintains healthy skin and normal levels of shedding in dogs. It also helps to reduce itching. One bottle carries 50 chewable tablets. Ingredients of this supplement include yellow dock root, quercetin, and omega fatty acids. The commercial name is Zesty Paws Allergy Immune Bites. It is one of the best solutions for dog allergies. Some of its components are Epicor which contains antioxidants that give your dog powerful digestive system as well as boost its immune system. The commercial name is Tylosin. 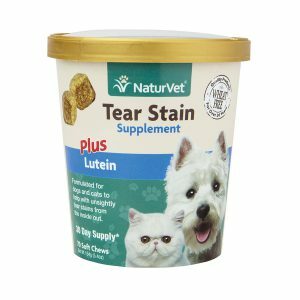 Free formula of the supplement contains Eyebright and natural, active ingredients to help eliminate unsightly tear stains from the inside out to give your pet healthy, beautiful eyes. The supplement Contains Marshmallow Roots to help lubricate mucous membranes and Oregon Grape Root for a natural antimicrobial.